New decade, two new Gold Wings: the GL1100 and GL1100 Interstate. Both featured a larger, 1085cc flat four engine, a longer, roomier wheelbase, and all-new air-assisted suspension, while the Interstate came fully dressed (saddlebags, trunk, fairing and windscreen) right off the showroom floor. 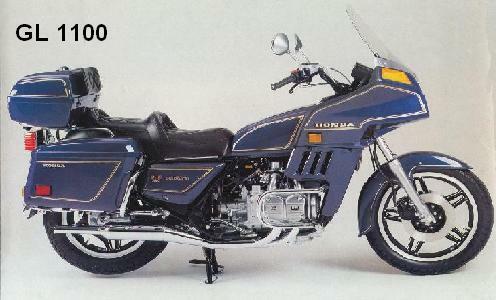 SaveCance	A huge hit with long-distance lovers everywhere, the Gold Wing Interstate continues to evolve ? a little sleeker, a little more polished ? as it enters its second year. Also available: GL1100. A third Gold Wing joins the family ? the GL1100 Aspencade ? upping the luxury touring ante even higher with a larger passenger backrest and handy passenger storage pouches. Also available: GL1100, GL1100 Interstate. New cast wheels stand out on the '83 GL1100, a year that also saw the Gold Wing's front forks get suspension-enhancing TRAC anti-dive control. The Aspencade here also featured all-new digital instruments. Also available: GL1100, GL1100 Interstate.